An Introduction to Blurred Genre in Ethnography | Teachers Act Up! For several decades now social scientists in a variety of fields have been seeking alternatives to the scientific paradigm in approaches to designing, conceptualizing and representing empirical studies in order to further understandings of human life—in families, classrooms, institutions and any number of interactional contexts. Anthropologists have been at the forefront of these movements, experimenting with a variety of “blurred genres” (Behar, 2007) including poetry, drama, fiction, and creative nonfiction. Ruth Behar, one of most prolific advocates and among the most talented producers of blurred genre ethnography, argues that “until the time comes when we pursue the art of ethnography without fear, ethnography will remain a second-fiddle genre, a poor stepchild of memoir and fiction, an academically safe form of writing” (Behar, 2007: 154) According to Behar, “safe” in the academy means access to jobs, scientific grants, and professional associations. While these privileges are not to be discounted, the implicit warning is that these goodies come at the price of being esoteric, easily ignored outside of a small number of field specific insiders, and to content ourselves with being very interesting people who write very boring books (Pratt 1986: 33 cited in Behar, 2007). I read many of these and other inspiring blurred genre scholars as a graduate student in the late nineties with a level of “reader’s interest” that stood in stark contrast to much of the other required scholarship I studied in order to become an “expert” in the field of U.S. bilingual education and merit a Ph.D. upon completion of my own ethnographic work. I often turned toward poetry writing as a side project, one that was marginal and/or separate from my ethnography of bilingual schooling (Cahnmann, 2005) and soon realized that my poet’s mind was also active, helping me to sort through my fieldnotes and shaping what ultimately composed them. My “leaping mind” (Bly, 1975:1) was alive and useful in the ethnographic project and became the source of meditation for poetry’s vitality in educational research (Cahnmann, 2003). While much as been written about the contributions creative genres make to ethnography, neither myself nor other blurred genre writers I know have written much about how theoretical and/or empirical scholarship informs creative writing. A handful of scholars working with “poetic inquiry” have written about taking liberties with theoretical prose and/or empirical interviews, seeking to convert it to poetry, e.g. breaking up the exact language of Foulcault or an interview transcript into lines and stanzas that appear to be verse (Prendergast, Leggo, & Sameshima, 2009). I have found these projects to be interesting intellectually but aesthetically uninspired and far from poetry. Poetry requires less fidelity to another’s precise words and ideas and more journeying to find what poet Samuel Taylor Coleridge (1772-1834) described as the “best words in the best order” to transform a lived moment into poetry. Academic discourse, as it frequently dwells in dense, multi-syllabic abstraction is often the antithesis of poetry, slicking the lyric down with theory like a crude oil spill, an accident with devastating aesthetic consequences for the wild life of art. “No ideas but in things,” is the famous dictum of America’s poet W.C. Willimas to explain the power of images such as the “red wheel barrow” to ground poetry in concrete particulars. While poetry may suffer from abstract theoretical language, I believe creative nonfiction (personal essay, memoir, “faction” [Nayaran, 2007, p. 130]) offers the genre space and craft strategies to embrace both creative and academic voices. Just as Behar (2007) advocates “reading ethnographies like a writer” (p. 148), I have been reading memoir and personal essays as an ethnographer in order to write more meaningfully about bilingual education. Through a doctoral seminar I teach titled “Translingual Memoir,” I have been exploring the intersections between big “T” anthropological theories and their place in personal and empirical narratives of bilingualism. Unlike poetry, creative nonfiction encourages what memoir writer Judith Barrington (2002) refers to as musing, “the presence of the retrospective voice.” Anthropologists have an edge when it comes to musing, as much of our “resulting wisdom” is informed by extensive theoretical study as well as empirical investigation. I agree with Barrington that it is the personal voice that carries the reader from the most intimate corners of the writer’s lived experience to the “wide open spaces of a shared culture” (p. 148), a culture the translingual memoirist may wish to transform through public/ation of personal narrative. I agree with Tsao (2011) that anthropologists need to write forms of ethnographic prose that are “legible and intelligible to the authors on the front lines of those [social justice] movements” (184). 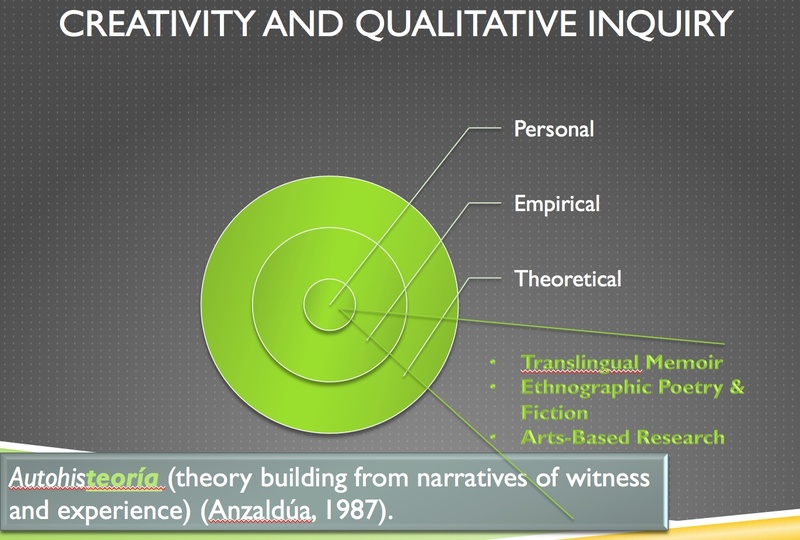 I am inspired by Chican@ scholar-artists (or scholARTists) such as Gómez-Peña (2000) and Gloria Anzaldúa (1987) who have embraced alternative notions of theory building from narratives of personal witness and experience, what Anzaldúa referred to as “autohisteoría” (Keating, 2000: 243). The invention of crush words can at times be an overly used “cute” postmodern glitch. But in this case I find inventions such as “scholARTist” and “autohistoeoría” (which merges autobiography, history, and theory) to be thought-provoking neologisms. I have often perceived the invention of crush words as an overly used “cute” postmodern glitch. But in this case I find inventions such as “scholARTist” and “autohistoeoría” (which merges autobiography, history, and theory) to be thought-provoking and theoretically informed neologisms, creative acts with language to produce new ways of thinking. The following personal essay [posted January 27] represents a contribution toward this project, interweaving my personal stories of struggle as a bilingual parent with theoretical, pedagogical, and empirical work. Despite a number of years spent as an ethnographer in public bilingual schools, the empircal gaze in this previous blog post is largely autoethnographic, attempting to understand the opportunities and constraints against widespread Spanish-English bilingual education in the United States. While I have written what follows so that it might stand on its own as personal essay or memoir, this introduction was written to situate it specifically for an audience of anthropology peers. Are we interested in anthropology that explores the field sites of “home,” including when the “native anthropologist” observes the culture of mainstream American English monolingualism? What balance do anthropologists seek in blurred scholarship between the ethnographic narrator’s “story” and theoretical and empirical foundations in order to both trust and learn from the writer to advance the field as well as engage the readers’ interest? While the terrain of ethnographic narrative is longstanding in journals such as Anthropology & Humanism and a regular slot of presentations through the Society for Humanistic Anthropology, are those of us in related fields of anthropology and education, medicine, policy and elsewhere prepared to embrace blurred genre as readers as well as writers, reviewers, and editors? If we do embrace such a shift, what does this require of anthropologists in terms of the ways in which we instruct theory, methodology, and writing craft? I wish to give permission to new generations of anthropologists to study writing as well as theory and to break the boundaries between the personal and the academic. Through the essay that follows I offer but one example of the way writing through personal narrative has helped me further explore my own participation in authoritarian discourses (Bahktin, 1986) that diminish U.S. bilingual potential as well as my role in shifting those discourses, opening up spaces for those of us on both sides of the “border/lands” (Anzaldúa, 1987) to live in permanent liminality between nations, languages, cultures, perspectives, and practices. Of course my author’s and educator’s hope is also that the writing that follows serves not only to entertain but also to inform the field of bilingual education, galvanizing those of us on the front lines of bilingual education policy and practice to stay the course. READ the previous post to see the Translingual Memoir portion–this is a work in progress. Your feedback is most welcome. Write me to request the complete cited references listed here.